TULALIP — As a couple, there are certain things you take for granted about life before kids — things like quiet dinners, spur-of-the-moment movie nights, and romantic getaways. For the past decade, my wife and I have shared our getaways with two increasingly large, loud roommates. We love our kids, and we couldn’t ask for better traveling companions, but there’s one thing you just can’t do with kids in your room. I’m talking, of course, about relaxing. Truly relaxing. Letting your worries wash away and treating yourself to a little luxury. That’s what the Tulalip Resort is all about. Here, you can lounge by the pool, try your luck in the casino, take in a show and indulge in various degrees of fine dining. Each step along the way, you’re greeted by friendly staff who seem genuinely happy you’re there and eager to please. The 8-year-old hotel is undergoing renovations a couple floors at a time, beginning with the top two floors, which were completed recently. We were lucky enough to stay in one of the refurbished rooms, which include new furniture and carpets, in-room refrigerators, 55-inch smart TVs, and fog-free bathroom mirrors with Bluetooth connectivity. Why do you need a smart mirror? Well, you don’t, but it does feel pretty cool to stream some classic soul tunes through your mirror while you enjoy a multi-head shower that hits you at three angles. The smart mirror sounded great and, as promised, it didn’t fog; my only complaint was that the image it reflected didn’t look like Channing Tatum — I guess it’s not quite that smart. 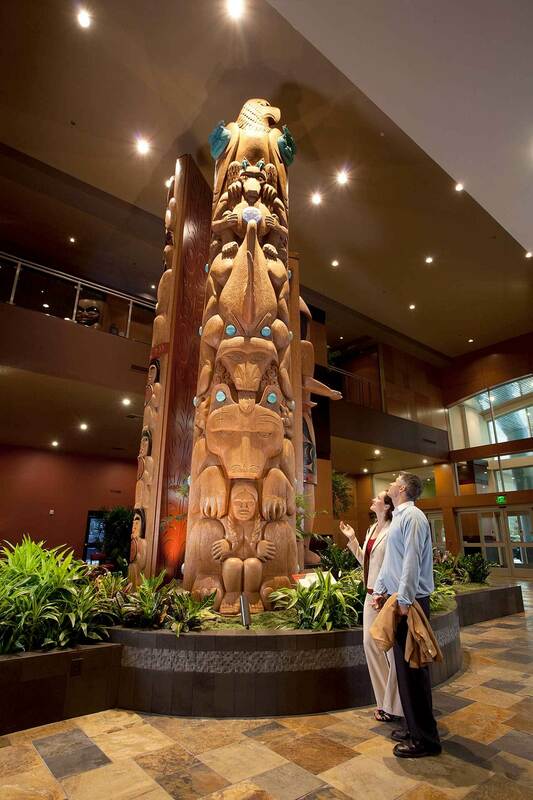 What’s really smart are the extra touches that make the Tulalip Resort stand out: the Northwest Coast Salish art that adorns the rooms, the spacious bathrooms with granite countertops, the handy USB outlets, the flexible LED reading lamps connected to the padded headboards on the beds. Creature comforts don’t come cheap, of course. Rates for standard rooms start in the lower $200s for midweek stays and climb to the mid-$300s for popular weekend nights. The cost climbs from there for the premium Orca Suites on the top floor or the family suites with two adjoining rooms. Work will continue until early 2017 to bring the new amenities to every floor. In the meantime, if you’re sensitive to noise and you’re not an early riser, you might want to request a room that’s a floor removed from the work. There was a little construction-related noise from the floor below us starting around 8 a.m. during our midweek stay. For us, it was no bother. We were too busy enjoying our uninterrupted couple time, exploring the resort and eating great food. For dinner we went to Blackfish, one of seven restaurants at the resort. Blackfish has a varied menu with entrées such as filet mignon and venison, but its specialty is seafood prepared using traditional tribal techniques. My skewered prawns were crisp and succulent, served mounted on polenta and wilted greens. My wife raved about the huckleberry-orange chicken, served with wild boar sausage, blueberry corn muffins, carrots and broccoli. If you’re looking for a dinner date destination, it would be hard to beat the food, service and ambiance at Blackfish. But there are other dining options, including a sports bar atmosphere at the Draft Bar &Grill, and the Asian-inspired Journeys East. For high rollers, the Tulalip Bay offers the resort’s finest dining, with prices to match. For a deliciously decadent way to start the day, try the Belgian waffle at Cedars Café. You can work off that waffle in the fitness room, located within the T Spa, but it’s more likely you’d want to go there to indulge in its massages or skin therapies. The spa includes separate men’s and women’s lounges with saunas, steam rooms and quiet rooms where you can relax by a fire. When you’re ready for more excitement, there of course is the adjoining casino. We tried to win our fortune and had pretty good luck before an ill-fated attempt to play a slot machine called “the Vanishing Act” — aptly named because it made $20 bills disappear. For the risk-averse, there are free musical performances most nights in the Canoes Cabaret. So if you’re looking for entertainment, there are plenty of options, but many of them would necessitate leaving your room. When you have a posh, child-free room and you can play music through your mirror, why would you ever want to leave? 10200 Quil Ceda Blvd., Tulalip; tulalipresortcasino.com; 888-272-1111. Restaurants: Fine dining at Tulalip Bay; Northwest seafood at Blackfish; Asian cuisine at Journeys East; a varied break-fast-lunch-dinner menu at Cedars Cafe; sports bar atmosphere at The Draft Bar &Grill; quick bites at Canoes Carvery; and Eagles Buffet. Entertainment: Canoes Cabaret hosts free musical performances Tuesday, Thursday, Friday, Saturday and Sunday nights; karaoke Wednesday; and additional ticketed shows on Fridays and Saturdays; Orca Ballroom and Tulalip Amphitheatre host special engagements from musical and comedy acts. Other amenities: Spa services include massage, body treatments, and skin therapies in 14 treatment rooms; the T Spa includes steam rooms, saunas and grotto showers. The Salal Marketplace specializes in Northwest-made goods, including Washington wines and tribal art. Oasis Pool is open 6:30 a.m. to 11 p.m.